I was lucky enough to be invited to take part in an information evening held by the gorgeous team at Etain Skin Hair and Body on the 27th of October. 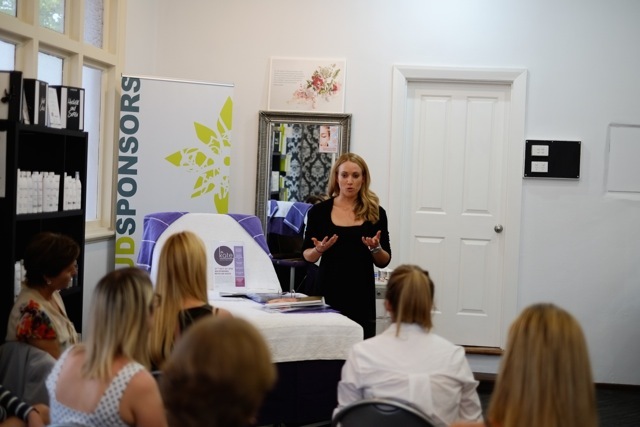 To celebrate Dr Kate Aesthetic’s new clinic at this boutique salon in Inglewood we invited a select number of clients to attend an information evening on cosmetic injectables, hosted by myself. It was a fun and interactive night which allowed me to give an informal introduction to cosmetic injectables to many clients who were interested in hearing more about these treatments. We held a Q and A session and despite my nerves (who actually likes public speaking?) I spoke about the history, mechanism of action, cosmetic indications and treatment regimes of wrinkle relaxers and dermal fillers. Whilst enjoying glasses of bubbly and eating delicious nibbles the guests were invited to watch me perform a full consultation with one of the lovely Etain staff members Sarah (thank you for being my guinea pig). During the consultation we discussed her areas of concern and tailored a a full treatment plan for her. The initial stage of her treatment plan and Sarah's main concern was to target her heavy frown lines and asymmetrical brow. Following the consultation I then performed a full upper face treatment demonstration with wrinkle relaxers whilst I talking through and explaining the procedure. Despite some initial fears about watching injections, I think most guests were reassured by Sarah’s smile through out the whole treatment. Not a tear or a bruise in sight. Having a chance to mingle and get to know both the staff at Etain and the local community was a fantastic opportunity for me. I am really looking forward to being a part of the team at Etain Skin Hair and Body. It's going to be so much fun! Dr Kate Aesthetics is now holding clinics at Etain on Thursday afternoons. The next event is Etain's Christmas party on Tuesday the 1st of December. If you’re interested in attending the party or want to know more about Dr Kate Aesthetics and Etain send me an email at hello@drkateaesthetics.com.au or Georgie from Etain at shine@etain.com.au. Or simply book online for a consultation and a chat (or coffee).